There is an interest to use small surface and implanted electrode arrays to measure muscle and lung tissue characteristics. 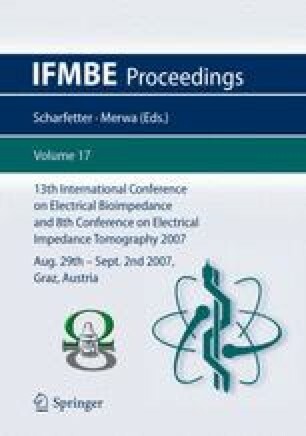 Using a finite difference model of the thorax with 3.9 million control volumes created from MRI images, linear electrode arrays with up to 22 electrodes with spacing of approximately one cm were studied. The arrays were placed on the surface, between the fat and pectoral muscle and between the pectoral muscle and the lung. Using lead field theory and sensitivity analysis, the contributions of the muscle, fat, and lung tissue to the total impedance were determined for various combinations of current excitation pairs and voltage pick up electrodes. For the surface electrode array the maximum contribution of the muscle was approximately 36% and for the lung 9%. If an isolated electrode array is place over pectoral muscle the maximum contribution of the muscle is approximately 73% and the lung 13%. If an insulated (fat side) electrode array is placed over the pectoral muscle the maximum muscle contribution is 90% and the lung 14% which occurs at different electrode spacing. The maximum values for the different tissues do not occur with the same spacing.